Queen sago Palm is actually not a palm, it is a cycad. Cycas are known to be the oldest living species on earth, unevolved for millions of years. Trees can be either male or female. Female of this genus produce the seeds and male produce a big cone-like fruit with lots of pollen. A particular specie of beetle carries out the pollination. So if there are no male trees around then it is almost impossible for the tree to bear fruits. Male cone has a pungent and disgusting odour which will keep most pests away. 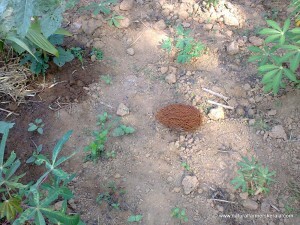 Traditionally it was used to keep pest away in fields. Unlike other parts of the world. Sago in India especially south India is never cut to extract its starch. Only the seeds are used. It used to be common food for Malayalees until a couple of years ago. 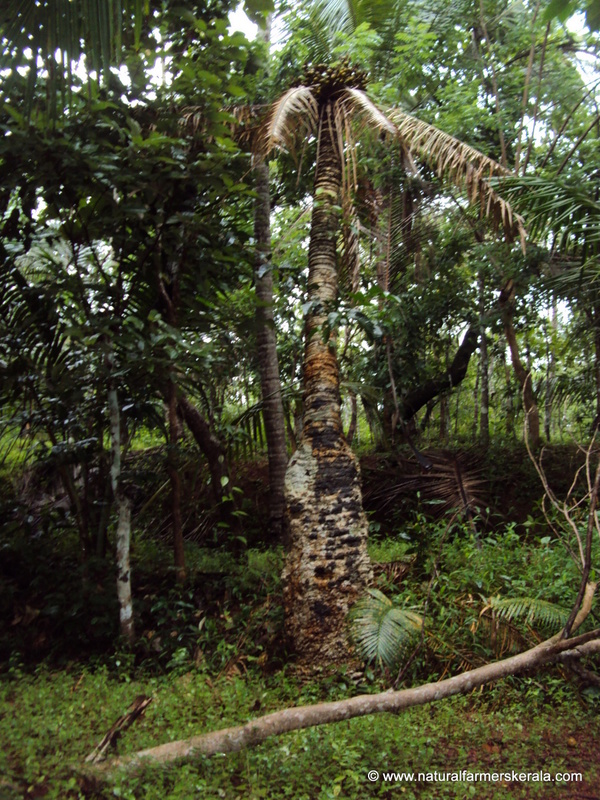 The specific variety that is found in Kerala is known as cycas circinalis. Kerala government records this species as endangered. Endangered status prohibits anybody from cutting it, however ruthlessly it’s bark was cut and sold to some distilleries in last few years. 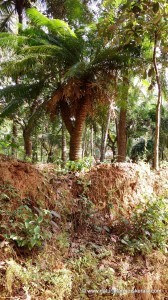 This exposes the bark of the tree to infection, nutrient loss, eventual and gradual death. Their resilience to survive through is noteworthy. It will not die even if it’s uprooted and left on the ground. The roots will find a way to penetrate the soil. It takes almost a hundred years for the tree to give its first fruit. Each ring on the tree denotes the year. 200 rings on the bark mean the tree is that old. Seeds ripen into a bright yellow shade from it’s dark green raw form. Ripe fruit attracts fruit bats resulting in the seeds dropping to far off locations. No other known species eat it as it is loaded with toxins. If consumed accidently, try vomiting and seek for immediate medical treatment. There was a research article about a tribe that ate bats which connected their diet with widespread neurological and degenerative diseases. How to Safely Consume Sago Seeds. You can tie a cloth around the seeds to be protected from bats while it is still on the tree (traditionally coconut leaf baskets were weaved and covered over it). Once harvested there are two traditional ways to process the seeds. Store it in a tight container or near to traditional hearth. Gradually the toxicity reduces. Minimum of three months is recommended for curing. However to be on a safer side you can stock it for a year. 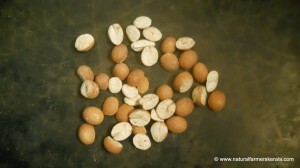 Crack the hard outer shell, split the seeds in two and then soak them in water over night. Discard the water (make sure you dispose the water out of pets and children’s reach as it is still toxic). Repeat the same process for 8 to 10 times. The toxic chemicals are washed away eventually. Dry under sun before. Consume or stock as needed. Alternately you can powder and stock in an air tight container. I like Eenthu Kanji (porridge) and Payasam (sweetened porridge). Puttu (steamed cake) is another option. When properly stored this flour can last for a couple of years. This was a staple during the monsoon season. Commercially available queen sago is not raised from seeds. It is extracted from the stem after cutting the tree and one tree can yield somewhere around 300 kg. I doubt about the medicinal qualities as it is cultivated for mainly commercial purpose. 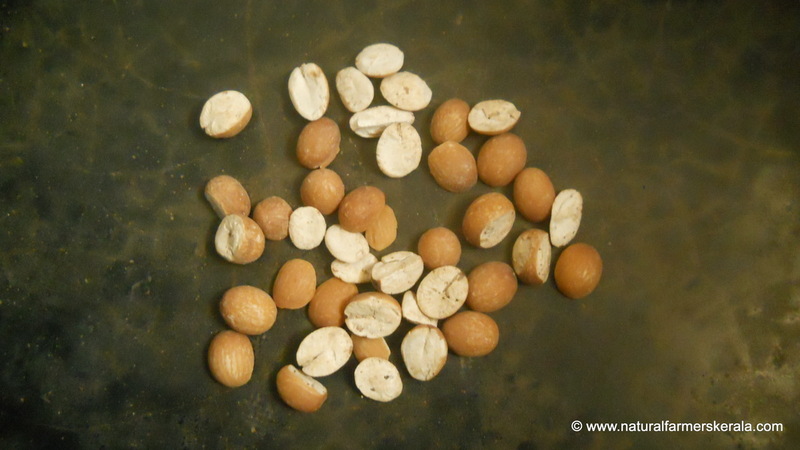 Eenthu seeds are loaded with aphrodisiacs apart from carbohydrates and proteins. It also has curative properties and is soothing to the stomach.